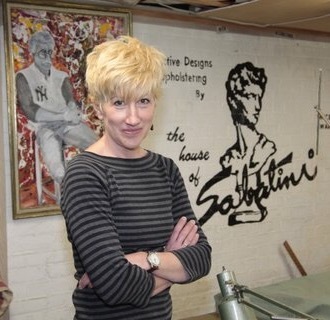 Sabatini Upholstering was established in 1962 by David Sabatini at its current location in the Historic town of Bangor, Heart of the Slate Belt. Daughter, Bernadette Sabatini, started working full time in the business after graduating Marywood College in 1982. Partners in the business for 24 years, Bernadette took over the business after her father’s death in 2006. David Sabatini started as an apprentice in the business in 1956 after getting out of the Air Force. He bought the business in 1960 and 2 years later moved to the current location at 34 Market Street. When he started he did carpeting, canvas awnings, window coverings, auto upholstering, residential and commercial reupholstering. His daughter Bernadette(now the owner), has worked at the shop ever since she was a teenager and before that she would work there after school. For Bernadette, she grew up in this business and its a second home for her. She was taught by working alongside her father all those years, she always says that she couldn’t have had a better teacher. If something wasn’t right, he would make her take it apart and start over! The showroom is filled with her father’s artwork: paintings, sculptures and murals. There is also plenty of upholstered pieces on the floor, so we invite you to stop by to see examples of our work.